With defined benefit pensions nearly gone from the landscape in the United States, tax-preferenced defined contribution Retirement Accounts have become the backbone of most people's retirement plans. Among those is the Individual Retirement Arrangement (IRA). Because of their near ubiquity, it is not uncommon for spouses or heirs to inherit an IRA from a loved one. 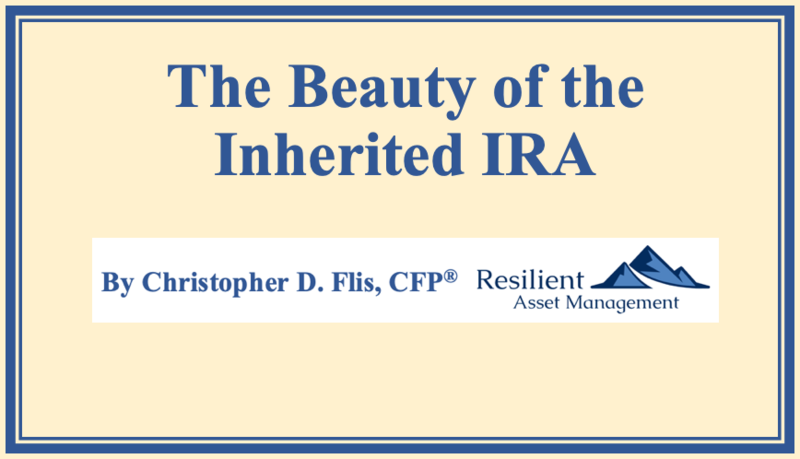 How a beneficiary handles an inherited IRA is laden with financial planning opportunities. "Individual Retirement Arrangements" were established within the Employee Retirement Income Security Act of 1974, otherwise known as ERISA. This far reaching document - still well in-force today - laid the ground rules for retirement accounts, including who can open them, how much can be contributed, governance, and protections. This is an exhaustive document. In its original form, the tremendous benefit of the IRA was the tax-deferral status of the funds within the account - pay no tax now, grow, pay tax later. This simple concept has not changed one iota since 1974 and is an attribute of which all investors should avail themselves. Since their original passage, IRAs have evolved in many ways. For example, the original maximum contribution to an IRA was $1,500 in 1975. Presently, in 2019, the maximum contribution is $6,000. Additionally, the "Catch-Up" contribution was born in 2001 with a stated end date of 2011. However, this provision was eventually lifted permanently. And of course, in 1997, the beloved Roth IRA came to be. This powerful construct enables contributions to grow tax-free for the remainder of the account owner's life. While intelligent people could argue about the merits of defined contribution versus defined benefit plans, there is wide agreement that IRAs serve a very useful purpose in both retirement portfolios and financial plans. Simply put, if you don't have an IRA of some sort, get one! As a consequence of the widespread use of IRAs, account owners pass frequently away with positive account balances. In many cases, these balances can be quite large. Thus, the account come to his/her beneficiaries. The rules governing Inherited IRAs are pretty straight-forward and are divided into 2 broad categorizations: Spouse and Non-Spouse. Treat the Inherited IRA as his/her own and consolidate with existing IRAs in the widower's name. The procedures and tax implication of a "Lump Sum" distribution are very simple. The inheritor receives a check. If the IRA was a "Roth", the proceeds are not taxable. If the IRA was "Traditional", the proceeds are taxable. The process for Disclaiming the assets is not trivial and you should consult a licensed attorney for assistance with this option. A tax advisor may also be of use if you choose this option. If the inheritor is the decedent's spouse, then generally speaking, consolidating into the surviving spouse's IRA is generally advisable. There are exceptions, however, so be sure to consult an estate attorney or tax advisor in this case as well. The other option - the Beneficiary IRA - is the focus of the remainder of this article. 1) You must choose a qualified custodian - the typical players: Vanguard, Fidelity, Schwab, etc. all custody Beneficiary IRA Assets. There is a slight wrinkle to the account titling as the account will generally have the decedent's name in the account title. For example, my Beneficiary IRA is Titled "Christopher Flis Beneficiary of [My Father's Name]". Also, you may be required to provide a copy of the Death Certificate to establish the date of birth and death of the decedent. Suffice it to say, when a loved one passes away, get a slew of copies of the Death Certificate...you simply can't have enough of those as every financial entity seems to want their own certified copy. Having them on-hand saves time and frustration. Once the account is open, the normal menu of investment options are available to you. Moreover, the investments are handled in virtually the same way as any other IRA. Up until now, the account dynamics have been pretty standard...now comes the fun part. Options 1 & 2 are pretty self explanatory...option 3 requires some further explanation. For distributions, divide the end of year balance by the life expectancy calculated in Step 2. In subsequent years, decrement the life expectancy by one year and calculate the RMD as in Step 3. My father passed away in 2009. In that year, I turned 36. I was a "named beneficiary" of one of his retirement accounts valued at $8,572 at the Date of Death. Using these facts, we can calculate a few data points needed to figure out RMDs. At the end of 2009, the account balance had grown from $8,572 to $11,397. Using the rules described previously, to calculate 2010's distribution, we take 2009's end-of-year balance and divide by 46.5. I received a check for $245 from my Custodian. Since this was a Traditional IRA, this is amount is fully taxable as Regular Income, NOT Capital Gains. Your custodian would report this amount to the IRS and furnish you a 1099-R.
You may choose to withhold income taxes from your distribution if you like. With an RMD, the funds received no longer have "tax preference". In each succeeding year, you repeat steps 2 and 3. The only change is to decrement the divisor by 1. So in the example above, 46.5 in 2009 became 45.5 in 2010. The good news is that most custodians will have this logic built into their software, so you need not bother with making this calculation if you do not want to. It is instructive, however, to have a basic idea of the numbers as a quality assurance check with your custodian. 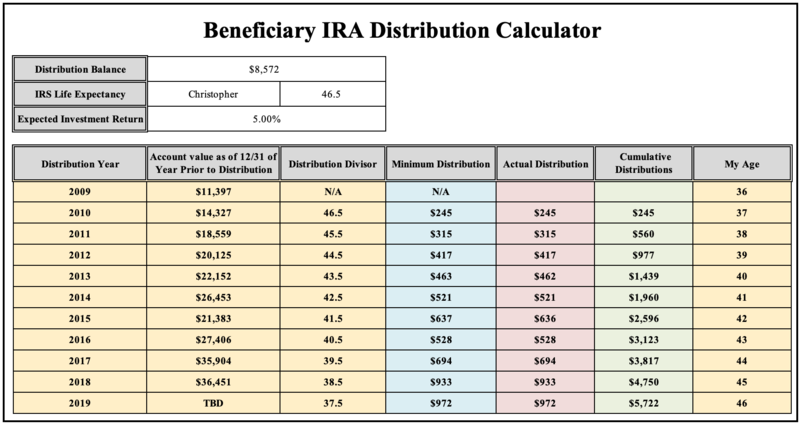 While not apparent in what I have described thus far, the true benefit of the Stretch IRA is the ability to have the Beneficiary IRA grow tax-deferred. For younger beneficiaries, there are quite long life expectancies, so the distributions are rather small, thus leaving most of the assets in the account to grow. This tax deferral inures in the beneficiaries favor as the powerful effects of compounding funds within the account are exacerbated when not burdened by taxes of any sort. For example, since my divisor was 46.5 in 2010, I only had to distribute 2.15% ( 1 / 46.5 = 2.15% ) of the account, which left 97.85% of the account to grow in subsequent years - and grow it did. Leaving aside the emotional aspects of a parent passing away. In this example, my father's passing coincided - almost to the day - with the "bottom" of the stock market correction that coincided with the Great Recession. While I did not know it at the time, in hindsight, this was a very opportune time to inherit this type of asset. As you can see, the decade following the Great Recession was indeed kind to stock markets. I won't mention any of the specific investments I chose as that is not the point of this article. 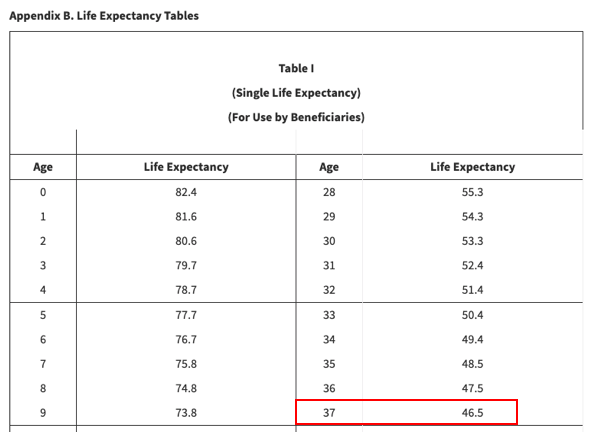 I want to emphasize the powerful construct of stretching out RMDs over one's life expectancy. Looking ahead, I fully expect to be taking distributions from this account for many years to come with the final distribution coming in 2056, when I must recognize the remaining balance in the account as regular income. More on what happens if I don't make it to 2056 in a minute. For the asset I inherited in 2009, I expect to eventually make 46 distributions totaling many times the initial account balance. As you can see in the example above, it does not take long for the powerful effects of compounding to take-off. All that is required is patience. Clearly, the last 10 years are uncommon, so perhaps the numbers won't quite be as good in other decades. However, the powerful effects of compounding have a way of smiling on the patient. 2) It is critical to have accurate Beneficiary Designations for ALL retirement accounts. At Resilient Asset Management, we review Beneficiary Designations each year with our Clients. Whether or not your partner with a Financial Planner, you should review your designations as well. When you pass away, what is on the paper becomes etched in granite and is exceedingly difficult to change. One of the key points is to have "Named Beneficiaries" on the form. If you have customized Beneficiary Forms provided to you by an Estate Attorney, your first question should be "does this effect the stretch provision for my IRA". If there is any hesitation, keep the conversation going. In addition to the exactness of the rules governing Inherited IRAs, typically the beneficiary is also dealing with the emotional effects of the loss of a loved one. The IRS is unwavering in the application of these rules and wants to get paid. So, if you are having difficulties, this transition is an excellent time to enlist the services of a Financial Planner who is a fiduciary. Using the example above, it is assumed I will live to age 83. Obviously, that is something of a moving target. Here again, the tax code is your friend. The rules permit me to name a Beneficiary of the Inherited IRA - I have named my spouse with my son as a contingent. Should either of them inherit this asset, they will simply continue the distribution schedule laid out above. For high earners, inheriting a Traditional IRA can be something of a burden in that the RMDs will be taxed at their marginal tax rate, which can be as high as 35% at present levels....a rich person problem. All is not lost though. Consider an example where an elder parent has a Traditional IRA as his/her primary asset. Further assume that the same elder parent has no other sources of income besides Social Security, thus leaving him/her in the 10 or 12% Income Tax bracket. In this case, it makes a lot of sense for the high-earning child to pay for the parent to convert the Traditional IRA to a Roth IRA. Thus, when the high-earning child eventually inherits the IRA, the RMDs will be tax-free. This is the higher-order Estate Planning you ought to get when working with your Financial Planner. Each employer retirement plan is unique with its own methods for implementing the rules laid out in ERISA or whatever its governing legislation is. Whatever the plan, the spirt of the rules described above generally apply. It is definitely worth asking your plan administrator how your account will be treated should you pass away. Generally speaking - there are exceptions - it is most convenient to get the money into an Inherited IRA at a reputable custodian. This is especially true if you inherit IRAs from the SAME person. In this case, you can aggregate all the inherited accounts into one Beneficiary IRA. For example, if my dad had multiple retirement accounts, I could have consolidated all the inherited assets into one Beneficiary IRA. Consolidation is definitely recommended in this specific case. For the Thrift Savings Plan (TSP), you can read a good overview of the rules here and here. For as great as the TSP is, dealing with an Inherited TSP account may be burdensome. For example, there is a mandatory 10% Withholding Tax (20% in some cases) on distributions. Moreover, if you have Roth and Traditional funds within the account, distributions are pro-rata between the two, which can be nightmare'ish planning and tax wise. Whatever the case, the TSP has Withdrawal Consultants available to serve you and answer any questions. Additionally, a Financial Planner could be an invaluable resource for you. The elegance and financial benefits of Inherited IRAs are not lost on our country's legislators. Clearly, it favors larger account balances - imagine if I'd inherited $85,000 instead of $8,500. Without getting into a political debate, suffice it to say it appears the wealthy are in the crosshairs to increase revenues for the US Government. While I would never make recommendations based on expected legislation, I would be derelict if I did not mention that Inherited IRAs are frequently brought up as ripe for change. You can read one of the latest recommendations here. On the off chance that any legislator is reading this - the existing rules are somewhat symbiotic: For example, I inherited $8,573, have received distributions of $5,722 and estimate I have paid about 25% of that total ($1,431) in Income Taxes on those distributions. And there is more to come for Uncle Sam...all that's required is patience. How any legislative change would impact existing Beneficiary IRAs is anyone's guess. For now, my suggestion is to use the current law to your advantage and deal with changes once they are official. Passing along an IRA is indeed one of the best financial gifts you can give to your heirs, particularly when the beneficiary is in a different generation, which is often the case. If you are uncomfortable with the concepts presented here, your tax advisor, estate attorney, and financial planner can assist you with crafting your overall Financial Plan to optimize your assets for whatever you are looking to accomplish. And remember, the investment results listed above say absolutely nothing about future returns - past performance guarantees nothing about the future. Moreover, if you are in any doubt, please consult a legal, tax, an/or a financial professional who can guide you through the process of properly inheriting an IRA...the scenario described here is and was for illustration purposes only and should not be taken as specific advice for you - you are unique and so to should be your financial plan! As you can see, the benefits from proper planning are quite real.